This summer a family holiday to the south coast of France beckons and it's already got me embracing all things Gallic for Charlie's wardrobe. Taking inspiration from JoJo Maman Bebe's SS15 collection, I've fallen for these three cuties. The classic navy Breton stripe is gorgeous and will go with everything, although I think it will look cutest paired with just a nappy! The two buttons on the left shoulder will make it easy to pull on/off in the summer heat making them a really useful detail. A twist on the traditional navy, this red nautical inspired tee is a bright flash of colour that is a really flattering warm shade. The sweet boat motif on the pocket and buttons are sweet detailing. Even better, the Breton t-shirt ranges are currently on a multi-buy deal. 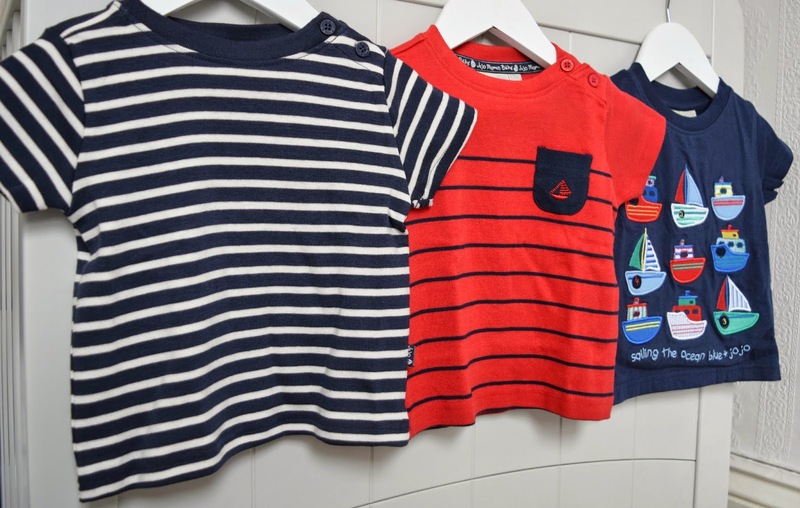 My final favourite is this really cute boat motif t-shirt which has baby boy written all over it! Since it arrived, I've been struggling to decide which boat is my favourite and am already daydreaming of our little one wearing it while paddling in the surf with a toy boat of his own in hand! Too much?